contributes to improved energy efficiency. 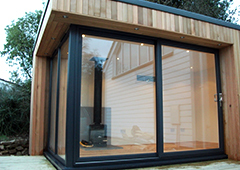 Your Garden room will be finished with high quality softwood skirting and architrave as standard. 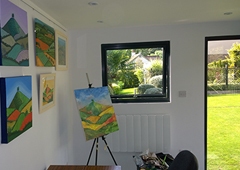 We provide a high quality painting and decorating service as standard, comprising two coats of high opacity matt emulsion to all walls and ceilings. Skirting and architrave and any specified decorative mouldings will be colour coded to meet your specific requirements comprising one coat primer, undercoat and two coats high gloss top coat if required. 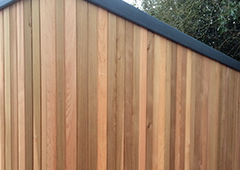 A choice of cladding finishes and in a range of profiles. We can also provide EWI Render, cedar shingles and cement board (Marley Eternit) Find out more. 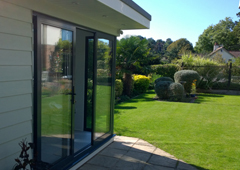 Options including UPVC, Aluminium or wooden windows and doors. 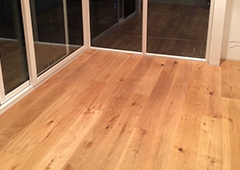 Quality flooring materials and attention to detail help create a fantastic end finish. We supply carpet tiles or engineered wood finishes. Find out more. 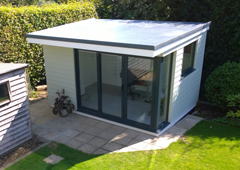 Depending on what finish you want fro your garden building we have a range of finishes and can also install lighting to your specification. Find out more. Our choice of roofing includes GRP roofing, shingles, tiles, green roof or single ply flat roofing. Find out more. 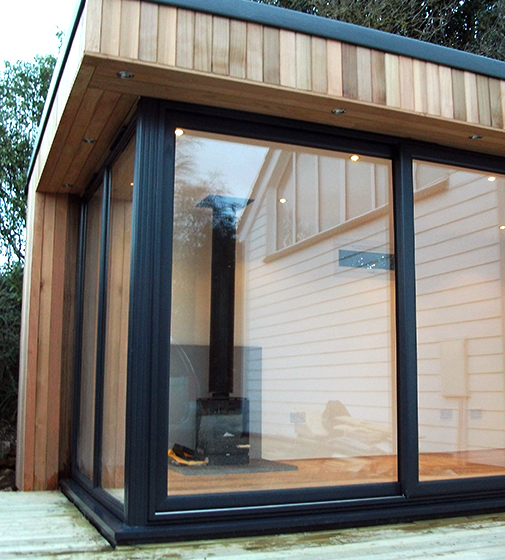 To compliment your garden room you can choose from a variety of additional features including projecting canopy's, timber decking and exterior lighting. Find out more.